Jesse Mark and Donald Mark, 1941. 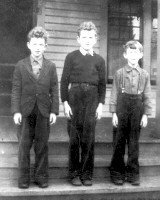 Me, my next older brother Jesse, and my next younger brother Herb, in 1941. I was ten years old, Jesse eleven, and Herb seven or maybe just eight.